PDF Writer Pro is a powerful, yet easy-to-use software tool capable of converting any document to a PDF file. Conversion is literally made as simple as printing the document, without the need to even have Adobe Acrobat installed! PDF Writer installs just like a printer driver, enabling you convert documents to PDF format just by clicking PRINT from any application! Creates PDFs from any application, including Microsoft Word, Excel, Auto-Cad etc. * Merge documents to single PDFs! * Common documents from all software applications are converted to PDFs at an very fast speed while keeping the look and feel of the original documents, reducing the size with compression, plus many settings that give you elasticity in PDF creation. Over 500 software products and document formats are natively supported. * PDF Writer Pro supports most features of the PDF format, including but not limited to: paper size, orientation, resolution, compression, compatibility, embedded images, fonts embedding, tables, formulas, figures, encryption, and password protection. * PDF Writer Pro is a professional PDF creator tool that gives businesses the means to effectively deliver documents to customers, partners and employees. Professioanl program for creating, editing and keeping up-to-date XML sitemaps. 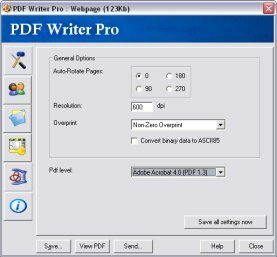 Qweas is providing links to PDF Writer Pro 2012 as a courtesy, and makes no representations regarding PDF Writer Pro or any other applications or any information related thereto. Any questions, complaints or claims regarding this application PDF Writer Pro 2012 must be directed to the appropriate software vendor. You may click the publisher link of PDF Writer Pro on the top of this page to get more details about the vendor.